Is This the Worst Flooding Year Ever? Q: How does this winter’s flooding in the Bay Area and Northern California compare to other wet years? A: It is not your soggy brain’s imagination: It was the second wettest July through February recorded in California since record-keeping began in 1895, as well as in my city of Santa Rosa (52.07 in.). 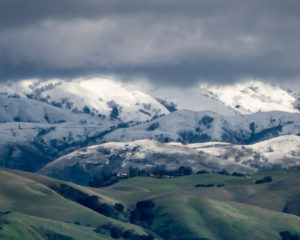 The snowpack in the Sierra Nevada is 180 percent of normal and climbing. Some of the consequences of all this rain have been mudslides, sinkholes, damaged roads, power outages, fallen trees, lost property, streams and rivers jumping banks, and the dramatic breaching of the Orville Dam spillway, resulting in an evacuation order that affected 180,000 people downstream of a potential catastrophe. Longtime Bay Area dwellers will remember a number of fairly recent floods. January 3-5, 1982, brought a particularly bad one. There were 231 destroyed homes, 1,500 damaged businesses, 33 deaths, and $280 million in damages, mostly from landslides. Around Valentine’s Day in 1986 came another big one, followed by severe flooding in March 1995 and again around New Year’s Day 1997. I believe you get the picture. We have periodic drought, usually followed by disastrous fires and then catastrophic floods. The only thing we are missing here in California is a biblical plague of locusts, and perhaps I should not mention that. But the biggest flood in historical times occurred during the winter of 1861 and 1862. There were no satellite images, but most likely it was an “atmospheric river,” the same type of rain event we’ve heard so much about this winter. This thousands-of-miles-long narrow river of water vapor carries a volume roughly equivalent to 7.5 to 15 times the average flow of water at the mouth of the Mississippi River! It can form from tropical air masses near Hawaii and so has become colloquially known as a Pineapple Express. Not only is the rainfall heavy, but the warmth associated with the tropical air mass also rapidly melts the snowpack. This one-two punch overwhelms the ability of the earth to absorb the water and the creeks and rivers immediately flood. This winter saw the most flooding in modern history, but our man-made reservoirs absolutely moderated the impact. There were no dams in 1861: It began raining around Christmas and essentially did not stop for nearly 40 days. The entire Sacramento and San Joaquin Valleys were under water, at times 30 feet deep and covering telegraph poles. Fourteen miles from any river channel, steamers rode across the floodwaters to rescue people. In Sacramento the newly sworn-in governor, Leland Stanford, was delivered by boat to the second story of his mansion. Oyster beds in San Francisco Bay died from the fresh water and sediment intrusion, 800,000 head of livestock perished, and approximately one-quarter of the taxable real estate in California was destroyed. Hundreds, maybe thousands, of people drowned. And, by the way, the California Indians in the region knew what to expect and headed early to higher ground. They had seen it before. So as bad as the flooding was this season, it actually could’ve been much worse. Stay tuned.